After scrambling up a traprock fissure in the woodlands of Southern Connecticut, I stop to get my bearings. I’m looking for a large, bare patch of exposed rock that sits atop this otherwise thickly-forested hill. Between research and examination of satellite imagery, I’ve grown convinced that the rocky outcrop I’m searching for may be home to one of Connecticut’s most unusual plants: a native of the state that is so rarely seen, and whose presence is so unexpected, that most life-long residents of Connecticut have no idea that such a thing could live here. After a short trek through the forest, I emerge from the shady understory and step foot upon an expansive, sun-baked ledge that is nearly devoid of trees. Almost immediately, I notice tell-tale clusters of showy yellow flowers sitting atop low-growing, oval-shaped, green pads. At last, this is the colony of Eastern Prickly Pear cacti that I’ve been searching for! The Eastern Prickly Pear (Opuntia humifusa) is Connecticut’s only native cactus, complete with the fleshy green pads and generous jacket of spines that we’ve come to associate almost exclusively with the arid regions of the Southwestern US, Mexico and Central and South America. Within Connecticut, this cactus is at the northern fringe of its range and its distribution is extremely fragmented. Colonies are usually rather small and isolated, making them difficult to find if you don’t know where to look. On this sun-scorched ledge, however, I am looking at what may be the largest colony of these “desert exiles” in the entire state. As I survey the extent of the find, I discover that mats of Eastern Prickly Pear extend for over 300 feet along the rocky clearing; a rare hill-top bastion for a species that is only very sparsely distributed throughout Southern New England. Eastern Prickly Pear is listed in Connecticut as a Species of Special Concern, meaning that while it may not be endangered in the strictest sense of the term, the Department of Environmental Protection recognizes it as possessing “a naturally restricted range or habitat in the state” and existing at “a low population level”. These cacti have always been somewhat rare in Connecticut, but not quite as rare as they are in modern times. Warmer coastal areas, in particular, were historically the stronghold of these cacti in Connecticut. These days, however, almost all of the state’s 250 miles of shoreline are crowded with cottages and businesses. 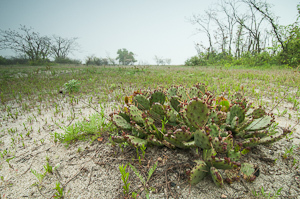 In the process of this widespread coastal development, Eastern Prickly Pear lost much of its habitat. Moving north from the seashore, the cactus becomes increasingly rare until it vanishes from the landscape altogether in the northern reaches of the state. Perhaps the most perplexing characteristic of Eastern Prickly Pear is its ability to survive a harsh New England winter and emerge from the ice and snow in the springtime ready for another to growing season! There are a number of cacti which are indigenous to the cold mountain tops of the Americas, where temperatures may routinely drop below freezing, but harsh New England winters are a different story entirely. In Connecticut, the evergreen Eastern Prickly Pear must withstand persistent wintertime lows of just over 20°F, as well as the occasional deep-freeze which can bring temperatures as low as -5°F! 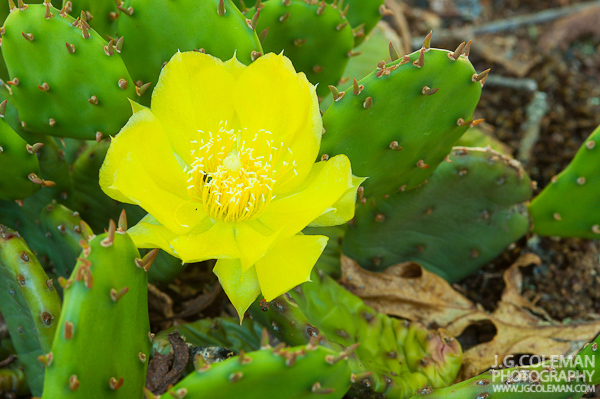 This level of cold-hardiness is certainly not typical of the Cactus family, but the Eastern Prickly Pear is able to survive thanks to an ingenious adaption whereby the plant allows itself to become largely dehydrated during Autumn. Once the freezing months of winter have arrived, the fleshy pads of the cactus appear leathery and “deflated”, having evacuated the vast majority of water that would ordinarily be stored during the summer months. This strategy ensures that the tissues of the cactus will not be damaged by the expansion of freezing water within, a phenomenon which would otherwise prove lethal. After months of research and exploration, I’ve managed to photo-document over a half-dozen colonies of Eastern Prickly Pear throughout Connecticut. In some cases, they can be extraordinarily well-hidden or difficult to access. But for those who are interested in seeing these remarkable cacti without having to bush-whack through the forest, there is at least one place in Connecticut where Prickly Pear can be seen quite easily: the Smith-Hubbell Wildlife Refuge, which is located in Milford adjacent to Audubon’s Coastal Center at Milford Point. 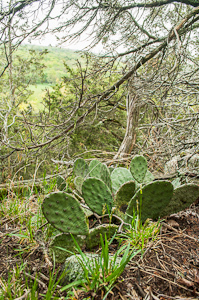 Here, from the comfort of a short boardwalk, visitors can see Eastern Prickly Pear thriving upon sandy scrubland in the warm coastal environment. All photographs of Eastern Prickly Pear above © 2012 J.G. Coleman Photography. View more photography by Trails of Freedom Chief Researcher, Justin Coleman, at J. G. Coleman Photography.